The 1 oz 2017 Gold Kangaroo is valued by the world's investors for its exceptional purity and striking design features. Each coin contains one ounce of pure 99.99% pure gold (.9999 24 carat). The weight and purity of these popular bullion coins is guaranteed by Australia's prestigious Perth Mint and the 2017 edition will be available from 10th October 2016. Launched as the Australian Gold Nugget in 1986, the coin's original nugget motif was changed to the symbolic red kangaroo in 1989. Its annually changing design and limited mintage has made the Gold Kangaroo a hit with collectors around the globe and the 2017 1 oz gold coin shows a kangaroo hopping through the Australian outback. The obverse of the brand new 2017 Gold 1 oz Kangaroo features the portrait of HM Queen Elizabeth II by Ian Rank-Broadley with the coin's denomination of $100 AUD. CoinInvest.com is delighted to bring you the 1 oz 2017 Gold Kangaroo bullion coin. Gold is one of the safest choices for investors and the value of this exceptional coin is likely to rise considerably over the coming years. 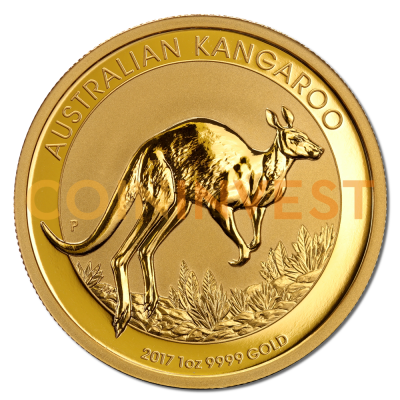 CoinInvest.com continually aims to bring its customers the most attractive investment options, like these 2017 1 oz Gold Kangaroos. We ship orders of 20 in foil trays or orders for 100 in boxes. This coin is for sure the best bullion investment, low premium over spot price and they are packed in a coin capsule. Also looks fantastic, great contrast between the matte finish and shiny kangaroo. Thank you Coininvest for the super fast (next-day) delivery!